So, I'm going to touch on a subject that most women do not discuss. 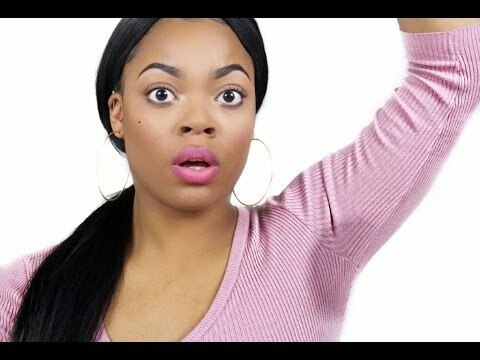 I'm writing about it because when I talk about it in a "safe environment", I find that it's a common issue that a lot of women face.....underarm sweat. My super close friends and I refer to it as an "Underarm Problem." My husband used to call me "pheromoney". I say "used to" because we have fixed the Underarm Problem. So let's start at puberty, I noticed it. I used regular deodorant and sometimes I would feel sweat rolling down my underarms. I couldn't really repeat tops after one wear because the underarms would smell sour at the end of the day. Sometimes they would still have a smell after I washed them. I tried Febreeze and other laundry solutions. Nothing worked. So, I just dealt with it. I wasn't insecure about it. I didn't like it but whatever. I'm still cute. When I went to college, all of the big time deodorant companies started coming out with "Prescription Strength" deodorant. Same issues. Except for now I'd have this film on my armpits. I'd have to scrub them separately to get the film off. SMH. By the time I turned 25 years old, I had tried the under crystals, which broke me out, so I figured out that alternating my deodorants helped. That seemed to work unless I was having a long day. I considered botox under my arms for my wedding but $1200 wasn't in the budget on top of the wedding expenses, so I put botox on the back burner. I tried Certain Dri and some other underarm gels that claimed to help with sweating. They weren't a good fit for one reason or another. At 32 years old, someone told me about Donna Karan Cashmere Mist deodorant. FINALLY!!! I found something that worked. It was $16 a pop but worth it. I didn't smell sour at the end of the day anymore. I smelled like perfume. It had sooooo much aluminum in it though, 17%. But my clothes would still smell sour in the armpit part. When I got laser hair removal in my underarms, that helped but only temporarily. I also tried a few brands I found in Europe and Sephora. Nope. Right back to Donna Karan. I did figure out that spraying apple cider vinegar on the armpits of my clothes would get rid of that sour smell. So, here I am, a 35 year old woman who can't get control over her Underarm Problem without spending $25 on deodorant....cuz that Donna Karan price went up every year. SMH. Then one day I had lunch with my cousin and she was telling me that had to have surgery. She was explaining how she knew something was wrong because her underarms had suddenly started stinking and she never had to use deodorant before that. I was jealous about that no deodorant thing but I started thinking. MAYBE, juuuuuuuusssst maybe, my underarm problem could be triggered by all of the crap they put in the deodorants I had been using. I was also pregnant. And you know how crazy pregnant women are about what they put in and on their bodies. So, I started trying natural deodorants again. First, I tried a direct sales deodorant, it irritated my underarms. Then a fellow Underarm Problem friend recommended Piper Wei, another natural deodorant. AND IT WORKED!!! I was so excited! FINALLY! I had started to notice my underarms getting dark though. I thought it was related to being pregnant, until I stopped using it for a couple days and the darkness cleared up. *sigh* Breaking me out again. Then I realized that most aluminum free deodorant have baking soda as one of the main ingredient. Baking soda was triggering an eczema like reaction on my underarm skin. I knew I couldn't be the only one dealing with this. So the mission began. So, it WAS the crap in the deodorant making me funky and having me think I needed more deodorant. LOL! Anyway, it took me long enough to get it right but I was able to solve a problem that most women have. Visit the Fancy Free Shop to see the full description of all of the ingredients and what roll they play in our deodorant to keep your underarms dry and smelling great.